The craft swap continues, a chance to share your arts and crafts supplies, get some new-to-you goodies, and get to know other people in the area while keeping stuff out of the landfill! This time we have a special set of demos and show-and-tell of fun arts and crafts by experienced crafters. We’ll also show how you can make paper at home, and some interesting ways to repurpose materials to make homemade crafts and gifts. It’s free and open to all. Come join us! Thanks to all who came. It was a lot of fun. 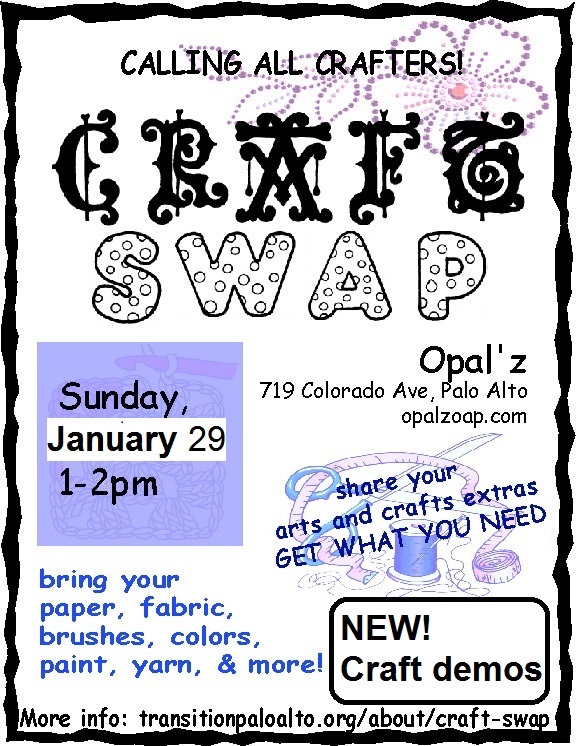 Please Save the Date: the next Craft swap will be March 18th at 1pm at Opalz.